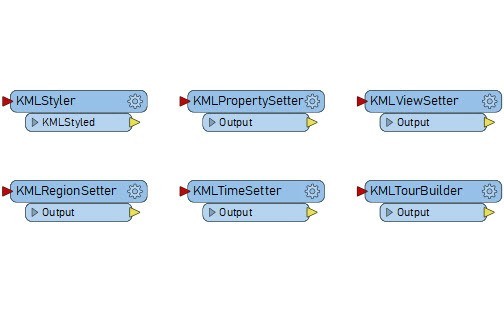 Use FME to restructure and style shapefile points, lines, or polygons to KML format. View your new file in an Earth browser or share it with others. KML (Keyhole Markup Language) is an official Open Geospatial Consortium format that is used in many industries. 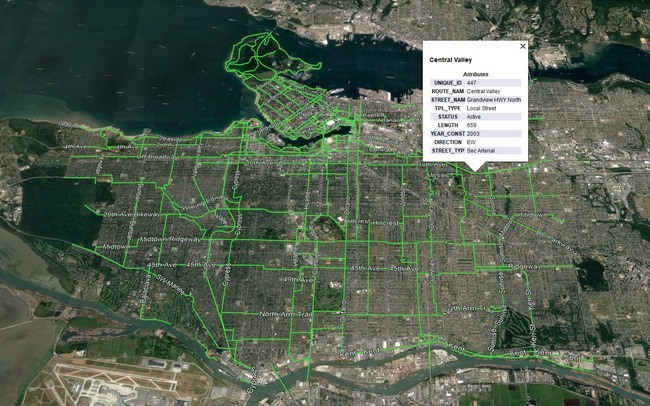 By converting shapefile vector data into a KML file, those unfamiliar with GIS will still be able to view the shape and location of your data. Your newly created KML files can be viewed using free Earth viewers like Google Earth or ArcGIS Earth. Having problems because you want a KML file, but only have a shapefile version of a dataset? Look no further! FME can easily transform your data with the drag-and-drop styled workspace. Learn to use transformers for converting coordinate systems and adding information to your dataset with the variety of tutorials that our experts have made on shapefile and KML conversions. 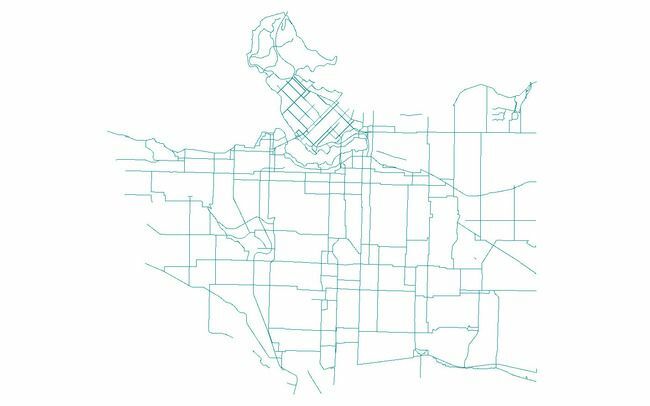 Before: A .shp file of bike routes in the City of Vancouver. After: The bike routes in .kml format. Each route has a balloon that can be viewed containing attribute information preserved from the .shp file. FME is designed to improve your productivity so you can spend more time using your data and less time fighting with it. Once configured in its intuitive graphical user interface, SHP to KML transformation workflows can run automatically in the background using FME Server. 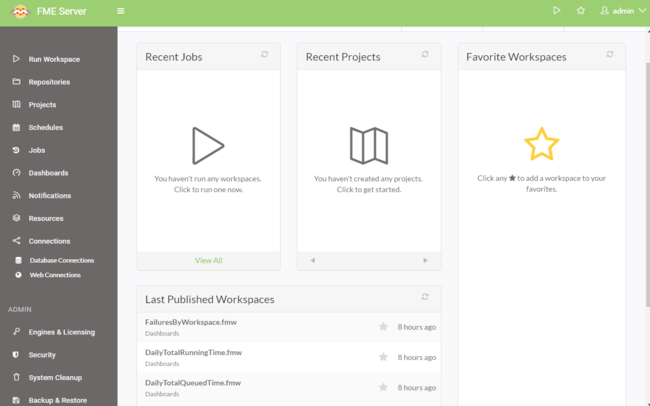 Set up schedules to run your workflow and deliver results to those who need it. There are many KML specific transformers that will help you to create the exact KML file output that you want. Use the KMLStyler to enhance your data with colours, or the KMLTimeSetter to show how your data changes over time. FME is your golden ticket to an endless amount of conversions and transformations. FME lets you integrate many applications and file formats. Here are some of the ways our users convert Shapefile. Esri's ArcGIS is a mapping and analysis platform for creating and managing solutions through the application of geographic knowledge. KML is XML-based notation for expressing geographic annotation and visualization on web based maps and earth browsers like Google Maps and Google Earth. It is an international standard of the Open Geospatial Consortium for all geobrowsers. FME is the data integration platform with the best support for spatial data. Save time by using its drag-and-drop interface to connect data from hundreds of formats and applications, transform data in limitless ways, and automate virtually any data workflow.